Hey!! Are you thinking to try Baba Ramdev Patanjali Dant Kanti Toothpaste? But confused whether to buy it or not finally? Then here is the Patanjali Dant Kanti Toothpaste review with everything you need to know about. I heard a lot about Patanjali Dant Kanti Dental Cream and other Patanjali products. But after watching the Dant Kanti commercial on TV, I decided to give it a try. So, I am writing this review after using the Patanjali Dant Kanti Toothpaste for around 2 months. 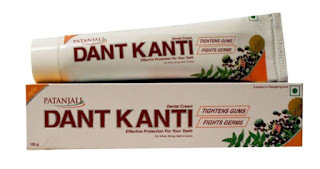 Dant Kanti dental cream is a product of Patanjali Ayurved LTD. and is manufactured in Bharat (India). Baba Ramdev’s Dant Kanti toothpaste is said to be completely an herbal composition and it is useful in dental protection and also helps in dental beauty. What Patanjali Dant Kanti Dental Cream Claims? Patanjali Dant Kanti dental Cream is for White, Strong Teeth & Gums. Gives a effective protection and long life to teeth and gums by making them healthy. Fights against dental problems like pyorrhea, bleeding & swollen gums, sensitivity and yellowing of teeth. Indication: Useful in Gingivitis, Toothache, Bad Breath, Spongy & Bleeding Gums. Patanjali Dant Kanti dental cream is contained in a white plastic tube with white round cap to close the opening. A tube is soft squeezable which helps the paste to come out easily on applying the little pressure. Also, the tube retains its shape after each squeeze. Further, the tube is packed inside the paper carton, like all other toothpastes. You can also buy the 30 g in just 10 Rs. Almost all the toothpastes in the market contains Fluroide. Fluoride in toothpaste can prevent cavities. Also, it helps remove plaque, a film of bacteria that forms on teeth and gums every day. 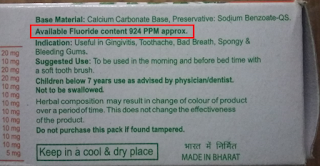 In Patanjali Dant Kanti toothpaste available Fluoride content is 924 PPM approx. Toothpaste with fluoride, is not recommended to infants and children because they may gulp or eat the large amount of toothpaste and this may cause some health issues. So, it is always advisable to keep an eye on the children while they brushing the teeth and keep the toothpaste locked up and out of the reach of children. I purchased the Patanjali Dant Kanti dental cream from the departmental store in my locality. It keeps all Patanjali products along with grocery products from other brands. The first time when I squeezed the Dant Kanti tube to put the paste on my brush, I just surprised as I have never seen brown toothpaste before. Yes, Patanjali Dant Kanti toothpaste is Brown in Color. Therefore, the foam appears whitish brown after brushing. A toothpaste that is softer compared to other chemical toothpastes ,it does whitens the teeth ,the product isn't that pricy ,you should try ones atleast. I am using this Patnajali Dant Kanti Toothpaste twice a day. It gives more of the Clove (Laung) smell and taste than the other ingredients in the toothpaste. All over I like the fragrance and the flavour. In cleansing I found it similar to other toothpastes, but it feels more refreshing as the taste of Clove (Laung) and blend of other herbs remains in the mouth for 3 to 4 hrs. Thus giving a cool fresh breath. 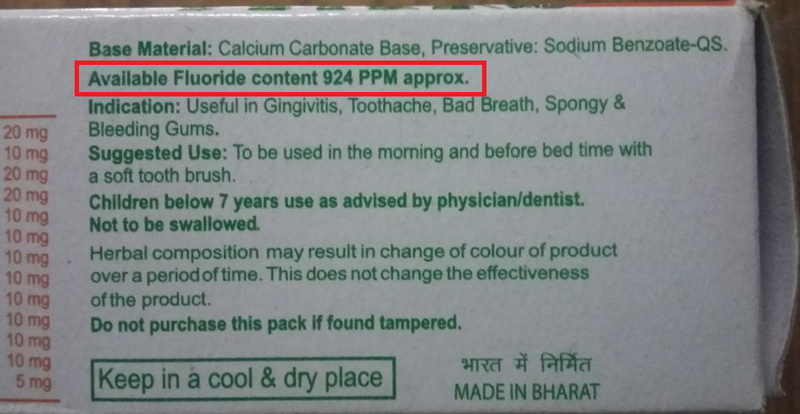 But I can’t say whether this toothpaste will be helpful or not in other dental problems as mentioned in the toothpaste. As I don’t have any such experience. May be other benefits will be experienced if I use the Dant Kanti toothpaste in the long run. So, initially I can say, Patanjali Dant Kanti toothpaste is useful for cleaning the teeth and for refreshing breath. As it is an Ayurvedic composition so there is no harm in using it. It's good, much better than close up which I've been using for a decade. Although it makes your mouth fresh. The freshness doesn't last long. It lasts for, say, 4-5 hours. After 5 hours, it loses it's effectiveness. I haven't tried Dabur products. I'll try and update this review. Round cap, which make it stand easily on the shelf or in the wash basin area. The brown color of the paste might not be liked by most of them. Not suitable for those who don’t like clove and other spices. Strong effect of clove and other herbs, thus not appropriate for infants and young children. Patnajali Dant Kanti Toothpaste Need time to get used to the taste.